Let’s feel the allure of this chic Cheetah pattern with velvet texture. This manmade material bowler satchel embellished with a belted PU leather strap and silver plaques giving this handbag a fashion statement. Two rolled PU leather handles includes a zippered closure to secure your belongings. Two main section compartments partitioned with a zippered pocket for organizing small items. Two open top pockets and one zippered pocket provide plenty of space for your smaller items or cell phone. An additional zippered pocket is located along the back side of this unique hobo for the things you need close at hand. Lightweight and classic style, wear this handbag purse to work and after work, causal or formal and never needs to dress it up a little. This hobo can be stuffed with daily essentials. 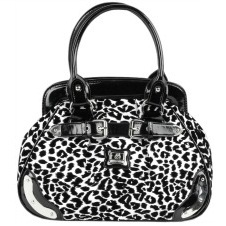 Black cheetah print with white background make an outstanding fashion statement. Multiple interior pockets to organize small items.